New at R+W: elastic coupling inserts from stainless steel mesh. 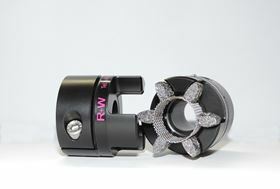 R+W coupling is offering elastic coupling inserts from stainless steel mesh. These inserts are designed to eliminate the temperature factors needed when sizing precision elastomer couplings, facilitating compact solutions even in the presence of high heat. Formed out of AISI 316L hard drawn wire, these new elastic inserts are corrosion resistant. They generally function in a temperature range from -30° to 500° C, with some special applications having run up to 600° C. This makes them suitable for oven conveyors and other heating systems, small hot work rolls, down hole oilfield equipment and much more. R+W uses these inserts in their own hydraulic test benches to avoid the problem of hot oil making the traditional plastic materials brittle. Capacities range from 2 Nm to a maximum acceleration torque of 1350 Nm, and a maximum bore diameter of 60 mm. Larger sizes are also an option for custom projects, as this insert type can scale up and change dimensions in a variety of ways, as a matter of the tooling.